On your way out to the bay, stop “At The Bridge”. We sell live minnows, worms and leeches. Everything you need to catch the big one!! 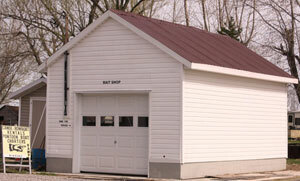 Use the boat launch across from the bait shop and you are minutes away from your favourite fishing hole. Parking available. Worms: $ 3.00 per dozen or $5.00 for 2 doz. Pop, water, and ice also available.